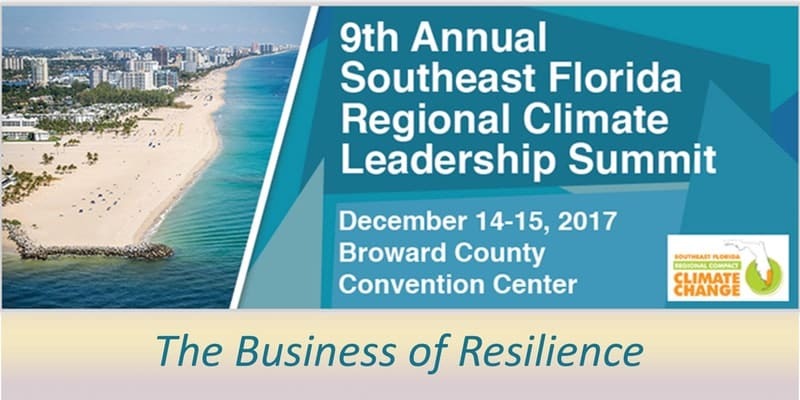 Broward County hosted the 9th Annual Southeast Florida Regional Climate Leadership Summit on December 14-15, 2017 at the Broward County Convention Center in Fort Lauderdale. The summit focused on “The Business of Resilience” to engage the business and wider community in critical discussions on adaptation, climate and energy solutions, and resilience. The summit featured keynotes and panels with business leaders; local, state, and federal government officials; and other experts discussing plans to ensure the region not only survives, but thrives, in the face of sea level rise and other climate impacts. To help guide these plans, the Southeast Florida Regional Climate Change Compact unveiled the newly updated Regional Climate Action Plan. The annual summit is coordinated by the Southeast Florida Regional Climate Change Compact, a partnership between Miami-Dade, Broward, Monroe, and Palm Beach counties, their municipalities and other partners. The Climate Leadership Summit is a major regional event focused on facilitating climate-related collaboration and knowledge sharing. The summit attracts innovative thinkers and leaders from business, government, academia, and the nonprofit community to exchange ideas and dialogue at panel discussions and networking breaks. Robin Barnes, Executive Vice President and Chief Operating Officer, Greater New Orleans, Inc.
Ed Strobel, President, Sunshine Solar Services, Inc.